Would you like to explore Santa's workshop, meet the busy elves and a Christmas reindeer, see the sleigh loaded with presents, and join in the festive fun? If so, open the surprise flaps and hear the wonderful, light-activated sounds in this Christmas sound book that's shaped like Santa's snow-covered workshop. With playful rhymes to read aloud to little ones, a sliding door on the cover, and enticing flaps to lift inside, Santa's Workshop is the perfect noisy Christmas story to share with babies, toddlers, or preschoolers, and a delightful interactive Christmas gift. This festive board book is filled with hands-on novelties for little kids. When they push open the front door slider on the cover, they find Santa, and hear his ho! ho! ho! and a merry tune. Inside, they find more entertaining characters hiding under flaps to fill their Christmas with sound: a reindeer with jingly sleigh bells, a busy elf making toys - tap! tap! saw! clink!, a cute Christmas pup - woof! woof!, tired elves snoring, and finally Santa, who chuckles as jolly Christmas music plays. Little ones will soon be joining in with the rhymes, and they will improve their fine motor skills as they lift the exciting flaps and discover who's hiding behind each one. 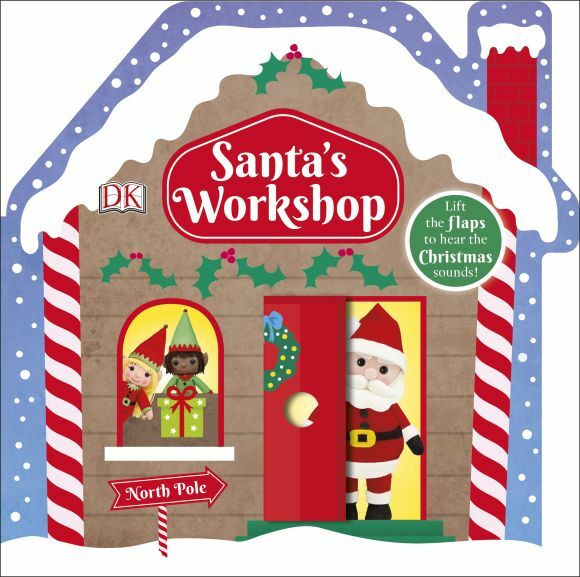 With its slider, lift-the-flap sounds, and fun shape, Santa's Workshop provides lots of opportunities for parent-and-child interaction, and hours of Christmas entertainment little kids will love. Note: Noisy book batteries are light activated. Please make sure the lighting is sufficient for this book.